Many moons ago, I was train chasing in Dunkirk, west of Buffalo. I was waiting for the 'A' to arrive at the road crossing. The 2-6-6-4 was heading west with a train load of fans. I was standing on the south east corner where a street crossed the tracks. I could hear the loco before I could see it and when I did see it, she was appearing and disappearing behind the rolling and hilly landscape. After she crossed the street about a 1/2 mile back, she was starting her whistle for the road I was at. I was merrily taking pictures as she pulled along side me. She hit the last note of the whistle with me 10 feet from the tracks. I'm sure someone has a movie of me jumping and covering my ears. Boy, THAT WAS LOUD! I thought about it hard and long. Ever here of the Cleveland commercial railroad? No? Hmmmm... How about Larry's truck and electric(LTEX)? That I do expect a yes. Well the story will not work so long story short. LTEX is a rental railroad in McDonald Ohio. They loan engines all over the world. here is a video. http://www.youtube.com/watch?v=Q1RVWSeIpeE I went their and "what in the bloody world?!" you will think seeing these! I will not go into detail(i will do that later.). Well The Cleveland Commercial R.R. is a industrial R.R. who does small jobs and has trackage rights on the Wheeling & Lake Erie R.R. They have had excursions. (a pic http://www.railpictures.net/viewphoto.php?id=282392&nseq=1 ) I was down at Bedford, around march, light snow on the ground. We were messing around(directions from Google maps are not good! ) looking for a certain area. I was looking at one of my model railroader magazines. i looked up through some brush. I noticed some gondolas passing through coming are way. Gave my dad a heads up and as soon as done talking, the lights went off! I thought get the camcorder. I did and was i was surprised! A SW unit passed with it's train. It is the same one as the one in the picture. Same train too! we gave chase and all you guys hate red lights right? We nearly lost it because he hit every one! Well the engine would slow down to 2-5 M.P.H. and we would go into a parking lot then it would thrash to 20 M.P.H! Well we came to a burger king and parked the car. Not knowing I ran over the bridge, and it was doing 5-9 M.P.H. ....AGAIN! I ran for nothing . 1 minute later i started to tape it going under the bridge. We lost after that. searching all over we did not find it. My dad suggested the steel mill. No, not their, Nice to see The Cuyahoga Valley Railroad diesel in clear view. So i still go down their to see if it is their. I have not got a thing passing their after 2 more tries. Well..... they say 3ed time is the best. updateI am thinking of doing the steam days story or my LTEX yard experience story next. I might do something small but interesting on Wednesday. I hope your enjoying this and everybody else's stories too. Hey this is not a one person thing you know. 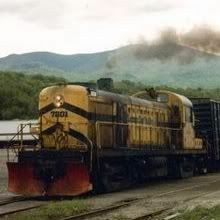 While walking down the tracks with my Dad when I was a kid, we came upon an idling Penn Central F unit coal train just as the new crew was coming on shift. They invited us onboard to see the locos. Got the full tour and they even let me drive it about 10 miles down the track back to our house. Wow, you guys are lucky. The only trains I see daily is the NYC Metro Trains. But my dad is going to take me to go train spotting. I belive there is an Amtrack Mainline or a CSX yard near my school. That should be fun. I remember when i first went with my grandpa back when i was 6. We wet to berea and had a blast. 3 years later I talked to my dad about it and now look what exciting things I've seen. Hope you have fun. Hmmm...let's see here, If it is like collinwood, expect lots of rentals! I have seen a LTEX over their with a CSX caboose. You will love yard action for sure. What to expect at a Amtrak main line? ummmmm..... let's say you'll probably see these guys...http://www.rrpicturearchives.net/showPicture.aspx?id=1440604. different story if electric. Well tell us how it goes. Ever heard of New York Cross Harbor Railroad? Well, its not NYCH anymore, but they still operate around Brooklyn, running down the middle of 1st avenue, and ferrying cars across the river. i just got back from railfest in altoona, this was the first time i was able to take my son there. our train count over 2 days was 83. traffic is way down this year, but the altoona helpers have fresh locomotives for the first time in years, rebuilt sd50s. i was able to show him one of the old conrail sd50s, gutted for rebuilding, with the new number spray painted on the fuel tank. he also got to see them using the turntable at the juniata shops. Well i was looking for some future projects/repaints to do in the future and found this! http://www.railpictures.net/viewphoto.php?id=286329&nseq=202 the only difference is their was 1 more modified flat car. I am sorry for not finding this earlier but hope this helps clear a visual picture. I know, that was for my weed killer story at berea. *snip* Time to put the scissors back. And people wonder why responsible railfans are given such a hard time!! Mr. B, how about removing this before more people think it's a good idea. when somebody darts out in front of a train like that the engineer has basicly 2 choices: either pray the person gets out of the way, or apply the emergency brakes and risk popping cars out of the train all over the place.